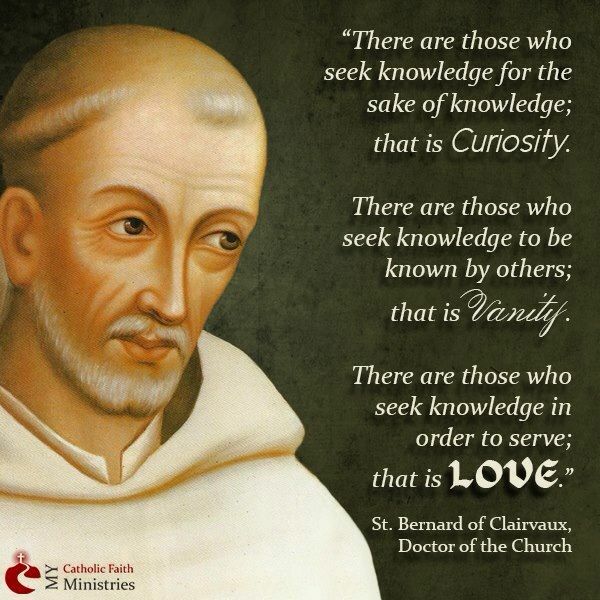 If you want to read about a great man of the Church read the life story of St Bernard. He is without doubt one of the outstanding figures in all Church history. The stories and legends about the man are manifold. He was born in France in the year 1090 and died on this day 1153AD. The new order of the Cistercians had just been found and was not doing very well, in fact it was in danger of dying out. Bernard arrived in Clairvaux with about 20 men and in two years he was made abbot. He founded 65 monasteries before his death. It is said that women used to hide their husbands away when he came preaching because the force of his preaching was such that their husbands would often leave and go to join the monastery. We have a Cistercian monastery right beside us here, about a mile from our home. We often go there for Mass and other services. They are a good bunch of men. As an Irishman, I am proud of the fact that St Bernard’s great friend was St Malachy of Armagh, who was born a few miles from here as well. In 1148 when St Malachy was returning from Rome he stopped at Clairvaux to visit his friend. On Nov 2, while visiting, St Malachy died there. St Bernard insisted that Malachy go into the grave prepared for him and when he was being buried Bernard took off his ‘habit’ and put it on Malachy. The two saints are now buried in the same grave. In the same year the Cistercians first came to Ireland and have been here ever since. St Bernard also has the honorary name of “The last of the Fathers.” His writings on the Song of Songs are a wonderful testament to Love and the love of God. Even today Bernard is very relevant to our Church: he fought against division and heresy, two things that plague us still.